Most of the men evacuated from the facility did not need any medical treatment, although several of the men were treated for minor conditions. Residents told police that staff members had been present earlier that day, but for the past few weeks, staff members had all left during the evening hours, leaving the men alone in the facility. Police are still trying to locate those in charge of running the facility, and they are also looking for stable housing for the residents who had to be evacuated. When an Illinois nursing home accepts a resident into its care, it assumes an obligation to provide a certain level of care. For example, nursing home residents are entitled to be treated with dignity and respect, and they should always enjoy sanitary living conditions. 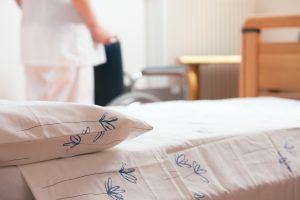 When a nursing home fails to provide these basic services, it is violating the rights of the resident and can be held accountable through an Illinois personal injury lawsuit. The most common types of Illinois nursing home lawsuits involve either physical abuse or neglect. While physical abuse or neglect may be recognizable, that is not always the case. Often, predatory nursing home employees select residents they know are unable to communicate with the outside world, or have a difficult time doing so. While abuse or neglect cannot always be stopped before it occurs, it is important that action be taken once abuse is discovered to deter future instances of abuse or neglect. If you have a loved one in an Illinois nursing home, and you believe that they are not being provided with the care that they need and deserve, you should consult with a dedicated Illinois personal injury attorney at Moll Law Group. At Moll Law Group, we handle all types of Chicago nursing home abuse and neglect cases, and we have decades of experience doing so. We aggressively stand up for our clients’ rights in hopes of securing a fair settlement for what they have been through, and if the other side is unwilling to provide fair compensation on their own, we will not hesitate to take the case to trial. To learn more, and to speak with a dedicated Illinois personal injury attorney about your loved one’s situation, call 312-462-1700 to schedule your free consultation. Pre-Trial Settlements Can Be Ways for Plaintiffs to Obtain Desired Result Without the Risk of Trial, Illinois Injury Lawyer Blog, May 3, 2017.